I spent most of an extended Xmas indulging in a decadent amount of over-eating, cramming in goose, game, ham and turkey alongside puddings, pies and cakes. And now January feels like a time to concentrate on quality over quantity, time to de-fat, detoxify and generally shape up (a little). It’s also time to play with some new recipes from Everyday Harumi i’ve had my eye on, and to use the multitude of interesting ingredients available to those lucky enough to live in London. 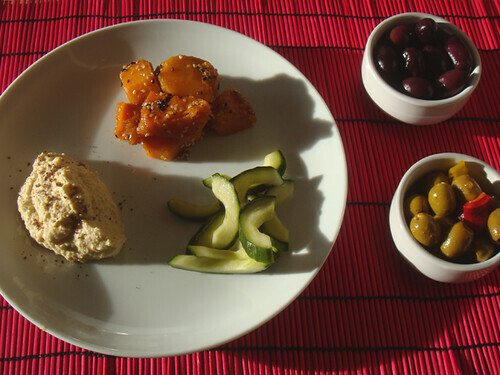 Dinner was: soy & sesame glazed butternut squash, Japanese style pickled cucumber, hummus, kalamata olives, 2 pittas each and south Asian sweets for dessert. The combination of Japanese and Mediterranean food worked well. The pickled sweet-sharp far-eastern flavours mixed well with the lemony, oily, nutty flavours of the hummus and olives. Both emphasize the freshness of ingredients and rely on strong, fresh, herby/nutty flavours. Pour the water, sugar and soy into a saucepan and bring to a simmer. Add the squash and simmer, stirring occasionally, until the squash is soft and the water is all absorbed. Add the sesame seeds and leave to cool. Slice the cucumber in half length-ways, scrape the seeds out with a spoon and slice diagonally into 5mm-ish slices. Mix rice vinegar with caster sugar & pour over cucumber. Leave in fridge for about 30 mins or so. You could probably add a dash of sesame oil as well, although i haven’t tried that out yet. Drain the chickpeas, keeping the water they came in. Add to blender with about 5-6 tablespoons of the liquid, the juice of the lemon and the olive oil. Crush the garlic and add. Blend it all together until it is runny. I don’t like to liquify it totally so that the end result has a bit of texture. Add the tahini and blend again until it’s something close to the consistency of peanut butter. If it’s too thick, add a little more chickpea water, if it’s too runny, add some more tahini. I then sprinkle sumac over it before i serve it to add a little zing.